The effects of time gradually stick in the skin; the skin gets slowly older due to genetic factors, eating habits, smoking, irregular sleep, sun rays, and environmental factors that are exposed. The spots appear on the skin, the mimic marks become clear, the scars emerge, the wrinkles become visible, the skin loses its elasticity and becomes droopy, the person may look much older than she or he is with the decrease in the quality of skin. The aging process of the skin may vary from person to person and its inconvenience is not the same for everyone. Skin aging, which is frustrating for those who care for their appearance, can be reversed by laser technology. The practical application of laser facial rejuvenation has become increasingly widespread in recent years with its minimal side effects and successful results. Laser technology, which can provide solutions to different skin problems, has been diversified and thus the possibility of treating aging problems as a whole has emerged. Laser is a fairly safe method of skin rejuvenation, but it must be performed by physicians who are experienced and have certified their expertise. The expertise of the physician and the quality of the used laser devices should be assessed in order to maximize the benefit of the laser beam given to the skin in a controlled manner for the needs of the person and to reduce possible side effects on it. 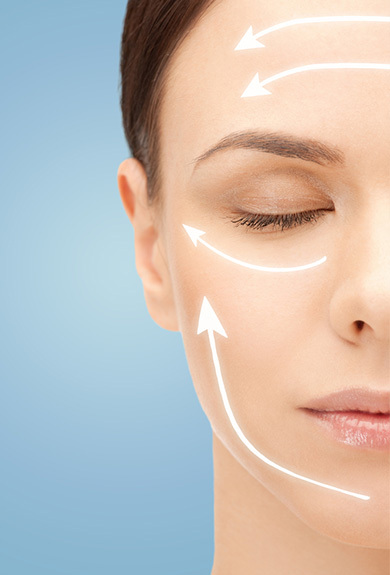 There are several types of lasers used for facial rejuvenation. The most appropriate type of laser should be determined specifically for the person after the assessment of the aging rate of the person’s skin and her/his skin structure. Laser application should be selected after the important factors such as the depth of the wrinkles, the age of the person, and the skin aging rate are determined. The CO2 Fractional Laser, which leads to the creation of microchannels in the skin by reaching the upper and middle layers in the skin region to be applied, triggers a healing process starting from its middle layer. When the skin problems are thought to be originally related to its middle layer, it can be concluded that the fractional laser is a very effective method. The number of fractional laser sessions, which provide the removal of fine wrinkles, the reduction of skin spots, the clearance of moles and benign tumors from the skin and so the skin rejuvenation, may change depending on the skin structure of the person. It is clearly seen that there is a change in the appearance of the person after 3 – 6 sessions on average. As the CO2 fractional laser therapy, which provides the reconstruction of the skin collagen fibers, is performed by applying anesthetic creams to the skin, there is no feeling of ache or pain during the session. The erbium laser used for the treatment of the scars, lines, wrinkles and spots on the skin influences only the upper layer of the skin. The upper layer of the skin is peeled and renewed in this treatment method which gives very effective results during the period when the signs of aging occur slightly. The patient can return to their daily life immediately after the erbium YAG laser therapy that can be safely applied to all kinds of skin. Laser beam can be given to the skin at different wavelengths with the Nd: YAG laser Q-switched feature, which is specially developed for those who want to get rid of sun spots, permanent tattoos, skin wrinkles and mimic marks. This type of laser, which can be used for different purposes, can be safely applied to all parts of the body. The Nd: YAG laser, which gives effective results when applied for facial and skin rejuvenation purposes, the number of sessions can be changed depending on skin problems and should be applied by the expert physicians, rejuvenates the skin by tightening the skin pores and stimulating skin renewal. It is necessary to avoid skipping the sessions and obey the number of the session recommended by the physicians in order to maximize the benefit from laser facial rejuvenation procedures. The sessions are painless as the procedure will be performed after applying local anesthetic creams. The laser maintains the comfort of the person and its side effects are minimal. Skin sensitivity and slight redness may occur but it loses its effect in a short time. The directives of the experts should be obeyed from a to z after laser sessions. The physicians will transfer detailed information about what the person should pay attention.